The Wildcats have been running independently, over the course of the last few days, due to Family Weekend. They came back to school and immediately had a race against other Lakes Region Schools ( St. Paul's School, Holderness School, Proctor Academy, New Hampton School, Tilton School, and The White Mountain School). The girls came in 5th place out of 7 teams and the boys came in 6th place out of 7 teams. Alisdair MacPhail (13th place, 18:28), Jonathan Bruner (22nd place,19:39), Ben Conway (41st place, 21:40), and Noah Farnsworth (47th place, 22:37) scored for the Kimball Union Academy Boys' Team. 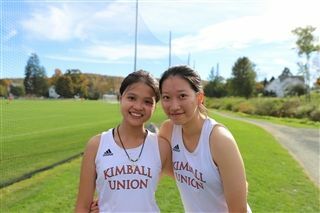 Eleanor Ashton (8th place, 21:27), Rachel Xia (24th place, 24:54), and Nancy Tran (25h place, 25:03) scored for the Kimball Union Academy Girls' Team. The WIldcats have now completed their regular season meets and are ready for Championship Season!